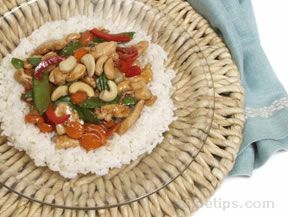 Prepare the rice before starting the stir-fry process, so that it's ready to serve once the stir-fry is finished. Combine all of the sauce ingredients and mix until the cornstarch is dissolved. Set the sauce aside. Important: Prepare and pre-measure all of the ingredients before starting the stir-frying process. Make sure all the ingredients are within reach when you begin stir-frying. Combine the chicken, egg white, soy sauce, and cornstarch in a bowl and stir until mixed thoroughly. In the wok or skillet, heat the oil over medium-high heat. When oil is properly heated, add the chicken mixture. Cook, stirring continually, until the chicken is no longer pink. Remove chicken from the wok or skillet and set aside. Drain the remaining oil except for two tablespoons. Add the ginger and garlic and cook on medium-high heat for approximately one minute. Increase the heat to high and add the carrots and peppers, stir-frying for two minutes. Stir the sauce that was set aside and add it to the carrots and peppers. Stir continually until the sauce comes to a boil. Add the chicken and the remaining ingredients. Cook just until heated all the way through. Serve immediately atop a bed of rice.